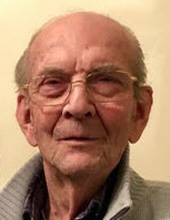 We are saddened to announce the passing of John (Johann) Schuster on March 20, 2019 in his 89th year. Loving partner of Anna Levovnik for 45 years. He is survived by his step-daughter Anne Barbu and step-grandaughters Danielle Barbu and Shelley Madison. John was predeceased by his brother Guido (Henny) from Winnipeg, Manitoba and Teresa from Austria. He is survived by his brother Joe (Hertha) from Utica, N.Y., sisters Millie and Francine and brother Stanislav of Austria, and niece Andrea and family in Winnipeg. Special thanks go to the very caring staff at The Carpenter Hospice. A private family service and cremation have taken place. "Email Address" would like to share the life celebration of John (Johann) Schuster. Click on the "link" to go to share a favorite memory or leave a condolence message for the family.